Summary: Many youth will experiment with alcohol and drugs, however some will proceed on to have problems with alcohol and drug abuse. Primary care physicians can help identify and screen youth for problems. 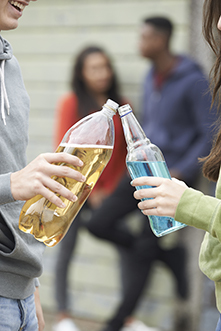 Using strategies such as motivational interviewing, primary care physicians can also directly help youth to stop their alcohol use, as well as help direct them to specialized addictions treatment. Continued alcohol use despite having recurrent social or interpersonal problems. Social, occupational or recreational activities are given up or reduced because of alcohol use. Signs or symptoms not attributable to another medical condition, mental disorder, including intoxication with another substance. CRAFFT is a mnemonic for screening addictions for children/youth up to age 21, recommended by the American Academy of Paediatrics. C)ar: "Have you ever ridden in a CAR driven by someone (including yourself) who was "high" or had been using alcohol or drugs?" R)elax: "Do you ever use alcohol or drugs to RELAX, feel better about yourself, or fit in?" A)lone: "Do you ever use alcohol/drugs while you are by yourself, ALONE?" F)orget: "Do you ever FORGET things you did while using alcohol or drugs?" F)friends: "Do your family or FRIENDS ever tell you that you should cut down on your drinking or drug use?" T)rouble: "Have you gotten into TROUBLE while you were using alcohol or drugs?" Validate whatever support the family/caregiver has provided, e.g. Clinician: "I am so grateful that you have been a support for your (loved one). If not for your support, I suspect things would be even worse." Encourage families and carers to be involved; the individual with alcohol use needs the support of other family members and carers, e.g. Clinician: "Your ongoing support will make a big difference for your family member." Ask about family's need for support, e.g. "How can I support you, so that you can support your loved one?" Provide written and verbal information on alcohol misuse and its management, including how families and carers can support the service user. E.g. Physician: “You have mentioned that you are having problems with low energy, and troubles at school and work. I wonder if this might have something to do with your alcohol use. What do you think?" E.g. Physician: "What makes you use alcohol?" E.g. Patient: "I get so nervous at work, that it helps me relax." Validate patient's feelings or positive goals for using, but without actually validating the negative behaviour? E.g. Physician: "I hear you. It makes total sense that you'd want to feel more relaxed." E.g. Physician: "Any negatives from using alcohol? For example, you mentioned that your boss is starting to notice." The goal is to help the patient examine benefits and barriers to change. Offer guided self-help, usually consisting of a single session, with the provision of written materials. Disulfiram (Antabuse), supervised oral disulfiram may be used to prevent relapse but patients must be informed that this is a treatment requiring complete abstinence and be clear about the dangers of taking alcohol with it. For driving: In most jurisdictions, the law requires that physicians report patients who, in the opinion of the physician, may be unfit to drive for medical reasons. For parenting: If a physician is concerned that alcohol/drug use may be affecting their ability to parent their child(ren), then the law requires that physicians report patients who, in the opinion of the physician, may be neglectful (or abusive) of their children. Alcoholics Anonymous: In general, groups are open to all ages, and depending on the location, there may also be specific youth groups available as well. National Institute for Health and Clinical Excellence (NICE). Alcohol-use disorders. Diagnosis, assessment and management of harmful drinking and alcohol dependence. London (UK): National Institute for Health and Clinical Excellence (NICE); 2011 Feb. 54 p. (Clinical guideline; no. 115). Miller RW, Rollnick S. Motivational interviewing. New York, NY: The Guilford Press; 1991. Written by Dr's Michael Cheng, FRCP(C), Psychiatrist, University of Ottawa, and Dr. M. St-Jean, MD, CCFP, University of Ottawa.